When speaking about a topic like the singing of ministers in the celebration of the Eucharist, there is a risk of seeing it in a manner that is distorted or incomplete, since we often concentrate only upon how or what the choir ought to sing, or about what instruments ought or ought not to be permitted in the liturgy, or whether the people ought to sing everything or are sometimes allowed to rest. The answers to these questions are available to anyone; all they have to do is glance at the existing documents. We shall speak about these themes below, merely repeating what everyone knows: there is a real and an imaginary Second Vatican Council. The real Council is the one we see in its documents; the imaginary is the one moved by that ineffable “spirit” that, “blowing where it will,” blows curiously often in the direction of many of today’s new-fangled liturgists. Unfortunately, their direction is saturated with immanentism, relativism, historicism, and so many other such things, to the point that it renders the true dictates of the Council a dead letter. “Great importance is to be attached to the teaching and practice of music in seminaries, in the novitiates and houses of study of religious of both sexes, and also in other Catholic institutions and schools. To impart this instruction, teachers are to be carefully trained and put in charge of the teaching of sacred music. Composers and singers, especially boys, must also be given a genuine liturgical training” (115). “Between the solemn, fuller form of liturgical celebration, in which everything that demands singing is in fact sung, and the simplest form, in which singing is not used, there can be various degrees according to the greater or lesser place allotted to singing. However, in selecting the parts which are to be sung, one should start with those that are by their nature of greater importance, and especially those which are to be sung by the priest or by the ministers, with the people replying, or those which are to be sung by the priest and people together. The other parts may be gradually added according as they are proper to the people alone or to the choir alone” (7). 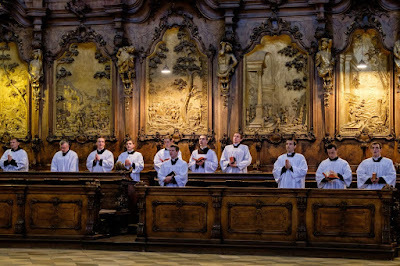 “Whenever, for a liturgical service which is to be celebrated in sung form, one can make a choice between various people, it is desirable that those who are known to be more proficient in singing be given preference; this is especially the case in more solemn liturgical celebrations and in those which either require more difficult singing, or are transmitted by radio or television. If, however, a choice of this kind cannot be made, and the priest or minister does not possess a voice suitable for the proper execution of the singing, he can render without singing one or more of the more difficult parts which concern him, reciting [declamando] them in a loud and distinct voice. However, this must not be done merely for the convenience of the priest or minister” (8). Now, in light of this tripartite division of the grades of participation in the sung Mass, it interests us to know what especially the first one comprehends, since it is the most basic one and can be used even by itself: “The following belong to the first degree: (a) In the entrance rites: the greeting of the priest together with the reply of the people; the prayer. (b) In the Liturgy of the Word: the acclamations at the Gospel. (c) In the Eucharistic Liturgy: the prayer over the offerings; the preface with its dialogue and the Sanctus; the final doxology of the Canon, the Lord's prayer with its introduction and embolism; the Pax Domini; the prayer after the Communion; the formulas of dismissal” (29). Now, it is enough simply to realize that here also it is speaking about the singing proper to the priest. Once all of this has been said to systematize and clarify the legislative aspect, it remains to ask ourselves why priests still do not sing, or rather explicitly refuse to sing. In fact, it is quite remarkable that those priests who loath polyphonic music because it “excludes the assembly from participating” (demonstrating that they have an “activistic” conception of participation, different from active participation) are the first ones to say that they “are unable to sing”. This would be a mystery for anyone who does not realize that we are dealing with a tragedy, a tragedy of formation (not only liturgical) of priests in recent decades, who have imbibed false hermeneutics of the Council and are imbued deeply with sentimental “liturgical” songs that have ruled the house in the long season after the Council. There’s no need to trouble ourselves here with neuroscience—a discipline that would be able to teach us about mirror neurons, the kind activated when others perform the same action. We do not need to know this to realize that we can’t pretend others will sing when the principal actor of song stands there silent and mute on the altar and fixes his eyes on them impassively. And the priest does not sing because he was not trained to sing, as we’ve already said, because he is the son of a liturgical and musical formation of the post-Conciliar period that has thrown away centuries of ecclesial practice per niente (no+ens), for an empty sentimentalism (which is not true sentiment) that has taken over our celebrations, suffocating them in its fatal embrace. 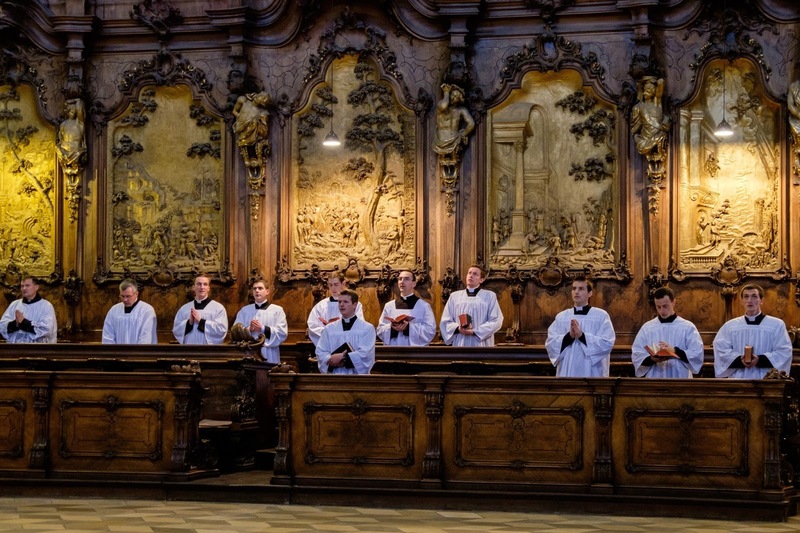 There are priests who sing, but these are a minority compared to the vast majority. It is well known that Pope Francis has chosen to prefer the urgency of action over contemplation, just as he prefers the ‘existential peripheries’ to the more or less comfortable sacristies, and daily concreteness to cultural cliques: the first objective is to re-evangelize the people—without resorting to the traditional means available—with words and simple, essential actions, making sure to give hope to the one who suffers, since he is a part of the ‘suffering flesh’ of Christ. But it is also true that sacred music, liturgical music and to some extent classical music was and still is a privileged instrument of evangelization. Music can bring us close to God: ‘He who sings prays twice,’ said St. Augustine. And what sense does it make in any way to humiliate choirs and orchestras (even involuntarily) by ignoring their presence (as on Monday 17th June)? His words to his collaborators might also cause perplexity, distinguishing ‘work’ from listening to music (considered, it seems, a waste of time). This is all quite enough to discourage people in the Church who have dedicated and continue to dedicate great and (according to us) much needed attention to sacred, liturgical, and classical music—in line with the previous pontificates. In sum, we should not wish that, in his peculiar desire to highlight what is essential in the Church and abandon the superfluous (for example certain tenacious accretions cemented by so many years of history), Pope Francis should reduce to the same category of ‘superfluous’ that which for its part is a fundamental part of evangelization, such as the music we have been speaking about. For walking together toward God cannot prescind from the emotions that impart beauty. True beauty” (note 2). I wanted to include such a large passage of Rusconi’s excellent article because it points out something of interest not only regarding Pope Francis but the clerical world in general: we need to recover that fundamental part of evangelization which is true liturgical music. And true liturgical music is not whatever piece happens to be written by priests, considered liturgical just because it has a liturgical text or because a priest has written it. The way is becoming more and more difficult and there is no evidence on the horizon of a serious reform of seminaries that takes these concerns into account. And our liturgies continue to be infested with songs that do not befit their dignity, sacrality, and grandeur. - Aurelio Porfiri is an Italian composer, conductor, writer and educator whose music is published in Italy, France, Germany, the USA and China. He has published 23 books, including “I would like to meet a saint: A Spiritual Diary.” Together with Prof. Peter Kwasniewski he promoted the Declaration on Sacred Music on March 5, 2017. He is the chief editor of ALTARE DEI, a magazine on liturgy, sacred music and Catholic culture.